For most people, cost plays a large role in whether or not they own a hot tub. Often, people assume that a high-quality hot tub is outside of their budget, and they don’t even consider it. Others believe that they can purchase a low-end, cheap model and get the same results as a top-of-the-line spa. However, smart consumers do their research and plan their hot tub purchase so they can get the best quality product at the best price, which is why you’re here. For more information about hot tub cost, maintenance cost, and hot tub finance options, check out the sections below. Hot tub prices vary according to size, model, and accessories, but you can expect to pay somewhere between $2,000 and $18,000 on your initial purchase. The more you invest in your hot tub up front, the more included features, like durability and energy efficiency. A higher-end model will last much longer than a cheaper model and will save you money over time on maintenance and upkeep. When estimating hot tub cost, you’ll also need to figure in chemicals (about $20-$40 per month), filters (about $45 each), and replacement covers. You’ll most likely need to replace your cover between four and six years after your purchase, and you can plan to spend approximately $500 for a new cover. Finally, you’ll need to include the cost of running the spa. Bullfrog Spas is the leader in energy efficiency, with an estimated monthly cost of $11.81, compared to other companies which can be as high as $18.80 per month. When you live in areas with colder weather, your hot tub will have to work harder to stay warm, which will result in higher energy costs. Make sure the hot tub you choose includes full-foam insulation and an advanced water delivery system, like the ones made by Bullfrog Spas, and avoid perimeter system insulation and excessive pipes and tubes. It is also wise to get a hot tub cover that is durable, fits snugly, and is strong enough to hold the weight of a heavy snowfall. Learn more about the best hot tubs for cold climates. 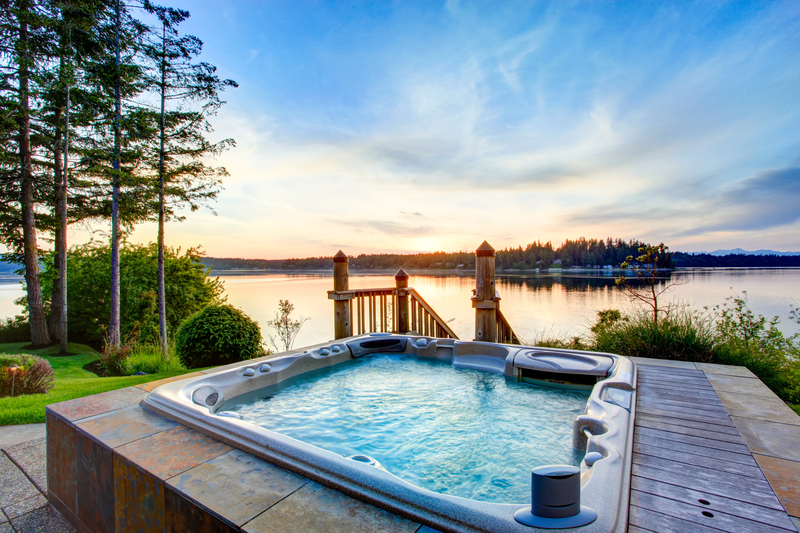 If you don’t have the full amount saved to cover hot tub costs, or you don’t want to use it all at once, there are several hot tub finance options available. One benefit to hot tub financing is that you are able to spread out the cost over time, which allows you to get the hot tub and features you really want. As with any big purchase, you want to gather information about all your hot tub finance options before choosing one, so you can be sure you are making the best choice for you. Hot tubs can be financed through the dealers themselves, which is great because you can finish the approval process quickly. A personal loan is another great way to go, and allows you to compare rates before committing. You can also use a home equity loan or a HELOC. Both of these involve using the equity of your home as collateral for your hot tub cost, but a HELOC works more like a credit card with a spending limit, where a home equity loan has a predetermined total given in one lump sum. As you conduct your research for buying a hot tub remember to also look at customer ratings to get trustworthy online reviews to make sure you are getting a great product. Get started choosing the hot tub of your dreams by visiting Robert Allen Pools and Spas today. Don’t forget to ask about our energy efficient Bullfrog Spas hot tub models.